Kaiju News | Everything Kaiju: Review Compares Godzilla 2014 to Jaws, Close Encounters, and Jurassic Park. Review Compares Godzilla 2014 to Jaws, Close Encounters, and Jurassic Park. 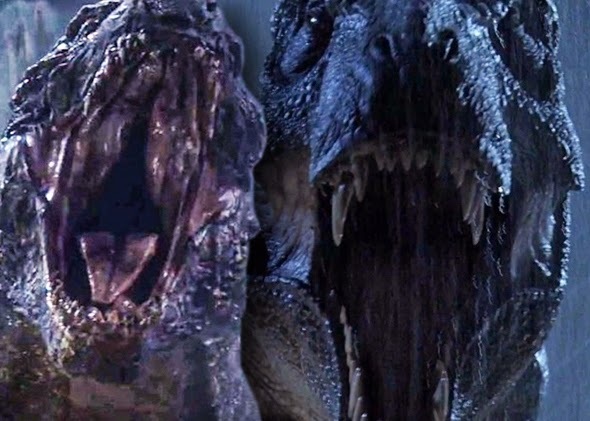 As an example of how well Godzilla could belongs to the canon of Spielberg classics, Slate Magazine points us towards two high-quality mashup by YouTuber Zack Preweit. Check them out below back to back. Both videos take the audio from Godzilla 2014 and artfully uses the imagery from the Spielberg classics. It’s no coincidence that these mashups blend together so seamlessly. While Godzilla is ostensibly a reboot of the franchise started by Ishiro Honda in 1954, what it really does is break down the DNA of Spielberg blockbusters like Jurassic Park, Jaws, and Close Encounters of the Third Kind and reconstitute it into a kind of successful clone and unofficial sequel. Most of the comparisons to Jaws and Jurassic Park have centered on the way Godzilla holds off on showing its monster until about an hour in. This comparison is spot on: As I documented (and charted) last week, Godzilla waits about 60 minutes before the big reveal, while Jaws waits 62 minutes and Jurassic Park waits 64 minutes (before showing the tyrannosaur). And Godzilla even teases the monster in a similar way—for the first hour of the film, all we see of him (or her) is his “fins” sticking above the water, just as in Jaws. Director Gareth Edwards himself has acknowledged this bit of inspiration, but this is only the beginning of the movie’s Spielbergian aspects.